New Rigged and Ready Series: Multi-Speed Trolling Rig rigged with 7/0 Hook with 125 LB. Mono. Billy Witch "Pro Style" is made for the serious bait fisherman. The Billy Witch's chrome/brass head provides just enough weight to keep the bait down. Nylon hair is hand tied with just the right amount of hair not to hide the bait and a strip of mylar..
Rig bait with standard spike end. Slide your Bait-Spring over bait. Then twist Bait-Spring clockwise over spike end until tight. C&H version of the famous 'Green Machine' lure. Swordfish, Bottom Fishing. - Fresh or Salt Water. - Super-Bright Diode. 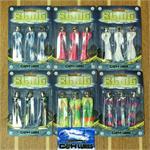 - Strobe - Swivels with the Latest Technology on both ends, no twist. - Easy to Install. Dolphin Delight is great for trolling plain or with strip bait. 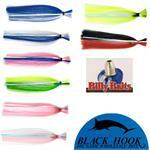 Plus the leaded head makes it an easy lure to sight cast when you see a school of dolphin. The famous No-Alibi Trolling Feathers, introduced in 1926, are a must to millions of saltwater anglers using them plain or rigged with natural baits. The Smoker Choker is a new light weight lure designed to troll at various speeds.